Union members and federal workers protest the government shutdown outside the White House in Washington, D.C., January 10, 2019. The United States government partially shut down at midnight December 22. This occurred because Congress and President Donald Trump were unable to agree on a continuing resolution to fully fund the government on a temporary basis. Money for nine executive departments thus ran out, affecting about one-fourth of federal government activities. The reason for the impasse is President Trump’s insistence on $5.6 billion for construction of a U.S.–Mexico border wall, which congressional Democrats strongly oppose. Trump has even threatened to declare a national state of emergency to deal with what he says is a humanitarian crisis at the southern border. Both sides have dug in, with no resolution in sight. Polls show that Americans blame the president for the shutdown. This is not surprising since he announced on December 11: “I am proud to shut down the government for border security.” Although Congress could pass legislation to fund/reopen the government, Senate majority leader Mitch McConnell has said he won’t bring to a vote any bill that President Trump is unwilling to sign. However, Congress does have the power to override a presidential veto with two-thirds majorities in both houses. Around 800,000 federal employees are directly affected by the current shutdown. 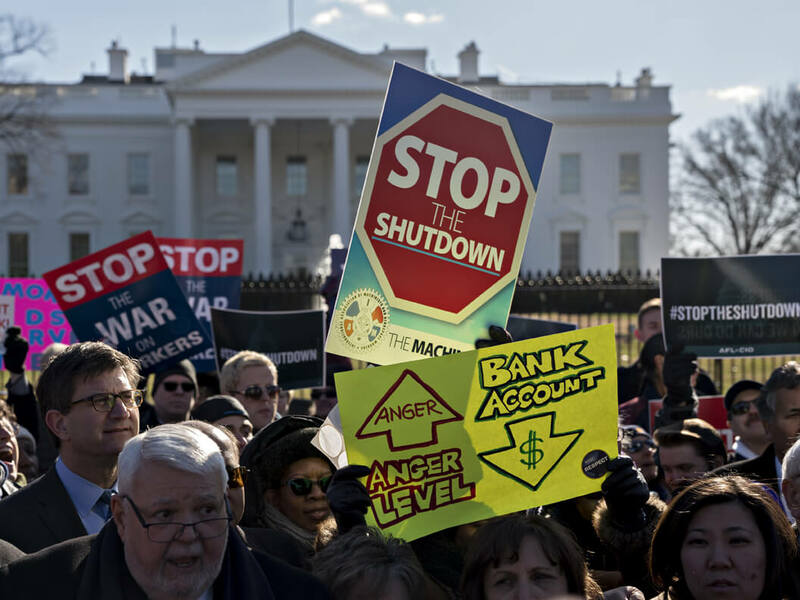 Many federal workers have continued on the job, albeit without a paycheck; others have been furloughed (ordered to stay home). All will likely receive full back pay once the shutdown is resolved, but payments to government contractors and their employees are just stopped. The impact is being felt throughout the country, not just in the capital area. Workers affected include corrections officers in federal prisons, FDA food inspectors, FAA air traffic controllers, and staff of TSA, Border Patrol, National Park Service, Coast Guard, and NASA, among others. The activities of the federal government may seem distant and unrelated to the day-to-day lives of many Americans, but a shutdown in fact makes apparent the national government’s vast reach and many connections to everyday life. Government shutdowns are an extreme result of the gridlock that has characterized U.S. government in recent years—but the words “partial” and “federal” are important to keep in mind. Much of the national government continues on mostly unaffected, as do state and local governments. Previous government shutdowns occurred for 21 days in 1995–96, 16 days in 2013, and 3 days in January 2018. If politicians in Washington cannot agree on spending priorities, a shutdown of the government’s so-called nonessential functions becomes a bargaining chip in budgetary brinkmanship. Thus, the underlying cause of any shutdown is hyperpartisan opposition. The complicated—one might say dysfunctional—budget process in Congress is made worse as a consequence of ongoing huge deficits and the ballooning national debt. None of this is helped by “divided government,” the situation where the legislative and executive branches are controlled by opposing parties—such as now, with the Democrat-controlled House of Representatives up against a Republican president. Personal finance and investing website provides in-depth context and explanation of current and past government shutdowns. Photo-journalistic look at the effects of the current government shutdown. Brief analysis of the prospects for an end to the current government shutdown. In-depth explanation of the current partial federal government shutdown—its background, extent, and consequences. Pulitzer Prize–winning documentary series on the border wall; includes helicopter video of the entire 2,000-mile-long U.S.-Mexico border, interviews and stories, podcasts, and a virtual reality experience.